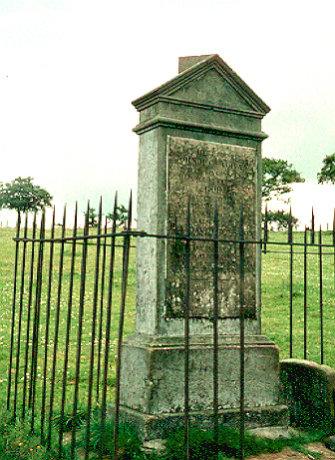 John MacGeachan's gravestone is located in a small square field to the east of Loganhill Road, east of Cumnock. The original small gravestone was erected in 1728 and is located to the side of the later memorial, which was put up in 1836. John MacGeachan was the tenant of the nearby farm, Meikle Auchengibbert, and he, along with local Covenanters, had planned to carry out an audacious attack on a company of dragoons at the Bello Path, near Lugar. These redcoats were escorting a captured Presbyterian minister, Rev David Houston, from Ireland where he had been apprehended, to Edinburgh, for trial and probable execution. They broke their journey at Cumnock, and spent the night in the Blue Tower Inn. The local Covenanters got to hear of this and resolved to rescue the captive minister on the morrow. On 28 July 1688, they ambushed the redcoats at the Bello Pass (now “Path”). They were successful in their action, and several royalist soldiers were killed. However, Rev Houston was injured. Also injured - mortally so - was John MacGeachan. He made his way towards his farm, Meikle Auchengibbert, but was unable to approach it – presumably because the redcoats were scouring the district, looking for the small Covenanter force – and MacGeachan was already known as a rebel. He took shelter in a turfed enclosure, in the Stonepark, but died of his wounds a day or so later.